The men and women of Salt Lake Community College soccer will receive a grand introduction Saturday at Rio Tinto Stadium. The first 300 people to use the promo code SLCCRSL will receive a discount. As the newest addition to the SLCC athletic program, Bruin soccer players will be introduced to Real Salt Lake fans during halftime of the match between RSL and FC Dallas. The community has been invited to share in the presentation. 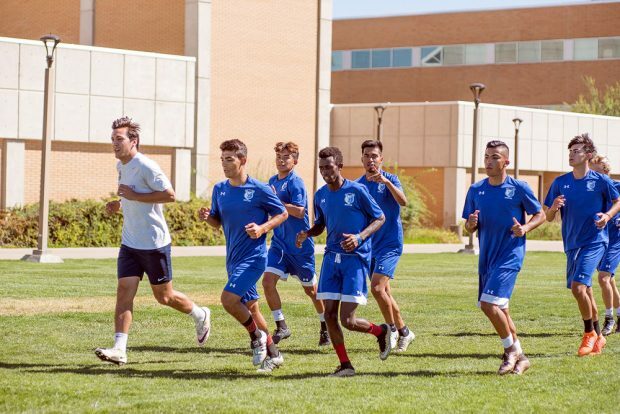 Before this year, soccer was a club sport at SLCC. While many of the current players had previously played on those club teams, additional athletes were drafted after tryouts earlier this year. SLCC will play the second of back-to-back road matches against Snow College in Ephraim before returning to Salt Lake for the halftime presentation. Both teams have achieved early success in their inaugural seasons. Fans can watch the Bruins play their home matches at the Taylorsville Redwood Campus.